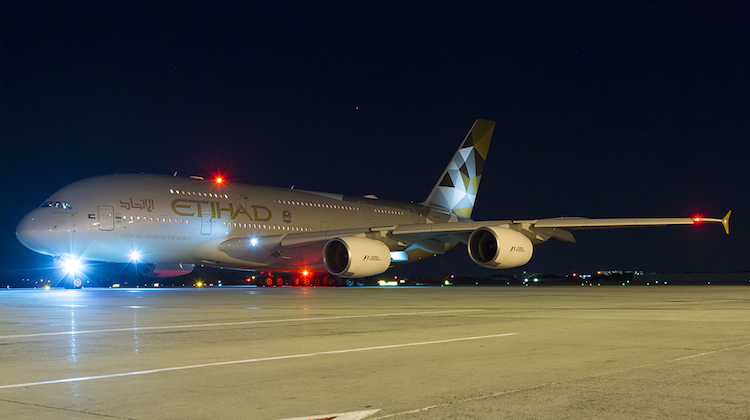 Capacity between Sydney and Abu Dhabi has increased by about 30 per cent with the arrival of Etihad Airways’ Airbus A380 on the route. Etihad’s inaugural flight to the NSW capital with its flagship double-decker superjumbo touched down a few minutes after 1800 on Monday. 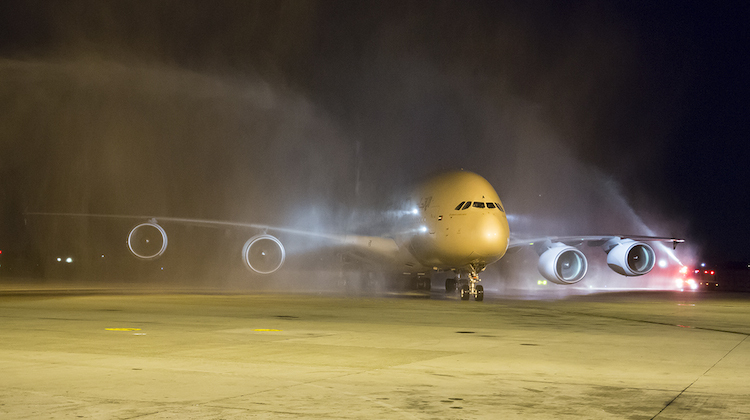 Sydney is only the second port to receive Etihad’s A380, which debuted on the Abu Dhabi-London route in December 2014, and the aircraft, A6-APA, was greeted by a traditional water cannon salute upon arrival at Kingsford Smith. Etihad will deploy the A380 daily to Sydney, with EY454 arriving in the evening and the reciprocal EY455 heading back to the United Arab Emirates after a short turnaround. The airline said upgauging to the A380, as well as replacing some services operated by Airbus A340-600s with Boeing 777-300ERs, to Sydney would increase the total number of two-way seats on the route by 30 per cent to 9,568 seats a week. 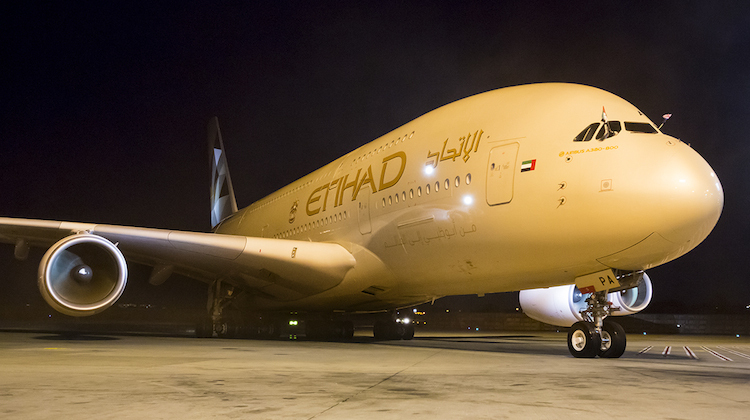 Etihad chief executive James Hogan said the increase in capacity would help meet the growing demand for seats out of Australia on the airline’s global network and particularly to London Heathrow. “In 2014, we achieved an 88 per cent seat load factor on our Sydney route,” the Australian-born Hogan said in a statement on Monday. “The A380 will provide us with much-needed additional capacity, particularly in business class, where we consistently enjoy high levels of demand for our services. To celebrate the arrival of the superjumbo to Sydney, Etihad hosted a function at the Sydney Opera House on Monday evening. At the event, invited guests were able to get a first-hand look at the airline’s Residence concept, with a demonstration model of the exclusive cabin – where two people share a living space, a bedroom, a bathroom and enjoy the services of their own butler on board – on display. A demonstration model of its A380 first apartments was also on hand. The airline is celebrating another milestone on Tuesday when the first Boeing 787-9 Dreamliner service to Brisbane touches down. The arrival of EY484 in Brisbane, operated by A6-BLB and due at 1750 local time, will establish a nonstop link to Abu Dhabi for the first time as previously Etihad served the Queensland capital from its home port via Singapore. And Etihad is also scheduled to launch a second daily flight to Melbourne from the start of August with Boeing 777-300ERs, representing an increase of 4,500 seats per week on the route. Poor Nicole, having to settle for Qantas first when flying to LA from Australia or does she fly via Abu Dhabi to enjoy those apartments? QF can’t even afford a 787……I read if they buy 787 the QF debt will be junk status….they just can’t compete………….even with the protected status in the domestic market. Still no Premium Economy, but private rooms with a butler etc. Guess I won’t be using Etihad or the other UAE airline. OK for celebrities, but I refuse to use products “endorsed” by them, including airlines.